Scorpion Stings are wounds or reactions caused on contact with a scorpion. It is generally a very uncommon incident. What are the Causes of Scorpion Sting? Scorpions generally sting on provocation, which may be unintentional or inadvertent, when they are suddenly disturbed. What are the Signs and Symptoms of Scorpion Sting? The signs and symptoms of Scorpion Stings depend on the species of scorpion involved and it can vary from one individual to another. The signs and symptoms also depend on the age (whether child or adult), weight, and overall health status of the individual (whether having an underlying condition or illness). How is First Aid administered for Scorpion Sting? 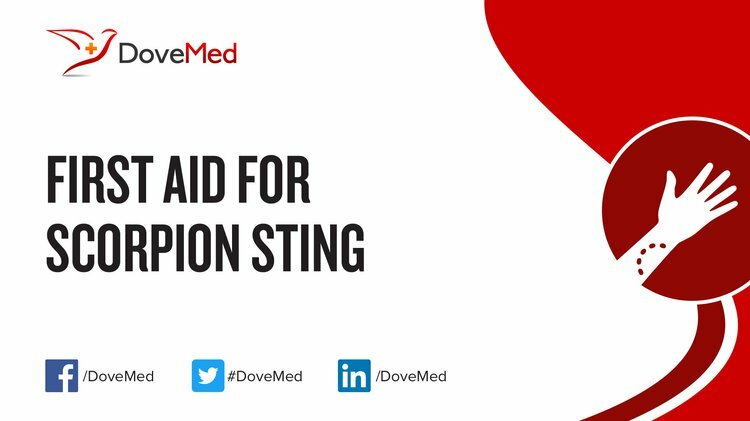 Who should administer First Aid for Scorpion Sting? What is the Prognosis of Scorpion Sting? How can Scorpion Sting be Prevented? Bawaskar, H. S., & Bawaskar, P. H. (2012). Scorpion sting: update. J Assoc Physicians India, 60(1), 46-55. Bawaskar, H. S., & Bawaskar, P. H. (2011). Efficacy and safety of scorpion antivenom plus prazosin compared with prazosin alone for venomous scorpion (Mesobuthus tamulus) sting: randomised open label clinical trial. Bmj, 342, c7136. Dehghani, R., & Fathi, B. (2012). Scorpion sting in Iran: a review. Toxicon, 60(5), 919-933. Prasad, R., Mishra, O. P., Pandey, N., & Singh, T. B. (2011). Scorpion sting envenomation in children: Factors affecting the outcome. The Indian Journal of Pediatrics, 78(5), 544-548. Kassiri, H., Mohammadzadeh Mahijan, N., Hasanvand, Z., Shemshad, M., & Shemshad, K. (2012). Epidemiological survey on scorpion sting envenomation in South-West, Iran. Zahedan Journal of Research in Medical Sciences, 14(8), 80-83. Chippaux, J. P. (2012). Emerging options for the management of scorpion stings. Drug design, development and therapy, 6, 165. Jalali, A., Pipelzadeh, M. H., Sayedian, R., & Rowan, E. G. (2010). A review of epidemiological, clinical and in vitro physiological studies of envenomation by the scorpion Hemiscorpius lepturus (Hemiscorpiidae) in Iran. Toxicon, 55(2), 173-179. Porcello Marrone, L. C., Marrone, B. F., Neto, F. K., Costa, F. C., Thomé, G. G., Aramburu, M. B., ... & Costa, J. C. (2013). Posterior reversible encephalopathy syndrome following a scorpion sting. Journal of Neuroimaging, 23(4), 535-536.